An affordable and easy to configure VoIP solution that can convert any computer into a phone system with the minimum of hardware and expertise. There was a time when even a small business was forced to invest in an expensive and overly complicated telephone switchboard. Along with the purchase and support costs, the biggest issue with these devices was their inherent inflexibility, making them a headache for any business that grew or shrank rapidly. To embrace new opportunities or to restructure a business needs a phone system that they can quickly adapt, a fact that explains why VoIP (voice-over-IP) solutions are so popular. bOnline has a VoIP system that prides itself on being a cost-effective and reliable solution that can level the playing field for a small business over its Enterprise competitors. We put our telephone voice to work to find out if this is indisputable fact or just hearsay. bOnline is available with three basic tiers; VoIP talk, VoIP talk 1200 and VoIP talk unlimited, all for a flat monthly fee. The lowest rung talk provides 100 minutes to UK landline and mobiles $11 per month. Talk 1200 boosts the call minutes to 1200 for $17, and as the name implies Unlimited allows as much calling as you can make each month for just $21. All plans include a free domain and two business email addresses, and you can add the ability to make 500 minutes a month to fifty countries for an additional fee. There isn’t a contract, enabling you can cancel at any time. As VoIP systems go, this is very cheap indeed. As VoIP systems go, bOnline VoIP is remarkably simple to install as it requires very little at the client end of the mechanism to work. For Windows desktop computers a ‘Communicator’ app is available that works and looks much like a typical messaging utility, allowing you to send and receive calls to those people on your contacts list, or through a keyed number. The Communicator app was created by Broadsoft Inc., a global communications software house that Cisco bought in 2018. Broadsoft also wrote the Communicator mobile apps that run on iOS and Android, which is why they look and act in such a similar fashion. By default, the app will access the Outlook contact list, if you still use that, and some integrations are available to other apps through a Hub including Salesforce, Twitter, Office 365 and Google. But, only oddly only the mobile version of this tool allows you to select stored Google contacts to call. Having yet another tool alongside Windows 10 and the specific taskbar apps for these applications all trying to alert you that a calendar event or an email has just come in from a contract might become annoying after a very short time. Because of this, we’d be careful about using the Hub and connecting all your services to it. We also noticed that it’s entirely unaware if you have speakers, a microphone or a VoIP handset connected. Without these, you won’t be able to use the system. What it does offer is the ability to access the included voicemail system, initiate a chat, and create conversation rooms where you can invite multiple people for a conference call. All the things like you can do with a hardware switchboard can be done through this, with call waiting, transfers, to voicemail, and you can record conversations. There is also a full history of all the calls you’ve made or received, and you can set the status of the phone to manage downtime. This app isn’t revolutionary, but it does most things those who use VoIP want and need, even if the integration side of it could do with some work. As an addendum to the desktop and mobile apps, bOnline also has a web interface called ‘my phone next’ that allows some functionality with only a browser. This feature could be useful if listening to voicemails away from the office is a requirement, and from here you can also redirect calls or get an email sent to you when someone rings. And, you can make calls using it. Where web-based versions are usually a subset of their desktop application counterparts, you can do lots with this one, including making changes to the system based on time, as in out-of-office hours and weekends. The security side of this solution is as basic as it gets. All accounts have a login and password, and if those are compromised then anyone can make calls as you or intercept the incoming ones. What the system badly needs is second-factor authentication, but it doesn’t offer that. For any business with high levels of staff turnover, like call centres, those that manage those using this solution will need to be proactive in revoking access once employees depart. Security isn’t a strength of this system and badly needs to be addressed. The performance of any VoIP system is mostly dependent on having the bandwidth it needs to be maintained and ideally isolated from other internet traffic. Trying to maintain call quality on a system where others are watching 4K video streams or downloading the latest system patches to every computer isn’t easy. And equally having hundreds of VoIP users fighting over a relatively narrow connection can result in performance issues. None of these issues is addressable from the communicator application, and therefore the QoS (Quality of Service) aspect of this product needs to be maintained by how the network is configured or segmented. We didn’t have any performance issues testing the solution, but we can simulate what might happen in a call centre when all operators are on a call, and the available bandwidth to the Internet becomes saturated. Performance planning might be something worth considering before deploying any VoIP solution, and not only this one. Plastered all over the bOnline website are glowing testimonies from satisfied customers on Trustpilot, with a rating of 9 out of 10 distilled from 2,474 reviews. However, using our powers of investigative journalism, we did find some users on other reputational sites that didn’t seem as impressed with bOnline. Admittedly most of the complaints centred on the other services that bOnline sells that include Web design, broadband, SEO and Domain registration. Broadband appears to generate the most complaints, but people have also reported customer service and billing issues. These are all typical issues for a company that is growing faster than its ability to manage those changes, and hopefully, it will resolve these operational issues soon. 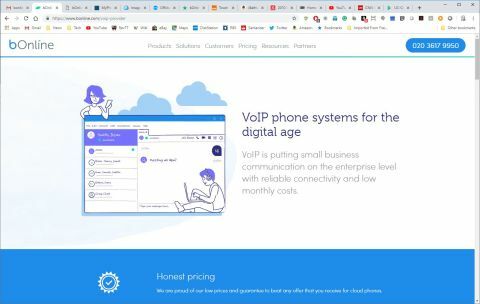 The solid ground of this review is that their VoIP solution works acceptably, at a price that is ideal for small business, and if should you have a problem you can shut it down quickly. However, the disruption that might have on a business is significant. Before you jump in with both commercial feet, it might be better to run a trial to establish better if this solution is the right one for you and your infrastructure and users.